You unlock this door with the key of imagination . . . The small outpost of Igbaak, Alaska holds an annual Christmas tradition in which Capt. Lane Pendleton of the Alaska State Police pardons a stranger during the Christmas Eve party. In order to pardon a “stranger,” Sgt. Yuka Mongoyak brings in her drunken brother Jack and places him in a holding cell to wait out the time for the tradition. To her surprise and alarm, another person is in a holding cell. He identifies himself as A. Traveler and describes himself as an extreme tourist. He plays to Capt. Pendleton’s ego when he says he wishes to be pardoned. At first everything seems fine. A. Traveler brings energy and happiness to the Christmas party. After a time, however, it becomes clear that A. Traveler has ulterior motives. Sgt. Mongoyak tries to find out anything she can about A. Traveler but cannot uncover anything about the mystery man. When A. Traveler reveals knowledge of the hidden lives of the townspeople, the party is disbanded and A. Traveler is again placed in a holding cell. Capt. Pendleton and Jack both witness strange antennae emerge on A. Traveler’s head. When pressed, he admits that he is not who he says he is. He displays incredible powers such as opening his cell door without touching it. He also reveals that Capt. Pendleton has disclosed to the Russians the location of a shed which controls the power to a nearby Air Force base. Pendleton denies the charge but rushes off to the location in anticipation of a Russian invasion. Sgt. Mongoyak, believing Pendleton to have committed the crime, follows soon after. Sgt. Mongoyak confronts Capt. Pendleton at the location of the power shed and attempts to arrest him. The act is interrupted by strange lights in the sky, the lights of invading alien spacecraft. A. Traveler was an advanced scout for the invasion and, revealing his true alien form to Jack, shares a piece of pie with the prisoner. “A Traveler” attempts to cram a lot into its fifty-one minute run time, not altogether successfully. The episode functions a bit like an homage to Rod Serling’s original series episode “Will the Real Martian Please Stand Up?” but lacks the original’s sense of humor and, for the most part, suspense. The social and psychological issues which the episode attempts to highlight include the legacy of American settlement in Alaska, the continued plight of indigenous peoples, the evils of policing in America (immediately following an episode in which this was also a central concern), alcoholism, racism, betrayal, and the secret hatreds we all hold in our hearts. Perhaps the central-most issue at hand is the idea that many would rather believe a lie than acknowledge an uncomfortable truth. This is certainly characteristic of American society today as citizens become increasingly dependent upon media outlets which chiefly function to manipulate one’s thinking to fall in line with flawed ideologies. By the end of the episode one wonders what the point of it all was, despite the rather refreshing aspect that all of the moralizing and finger pointing ends up directed at nobody in particular but at all (of us). This episode would have been far more enjoyable had it simply committed to the inherent spookiness of its premise. The production values of this new series are very high but the episodes occasionally feel confused, tonally discordant, and unfocused. If I have one overriding complaint about this new series it is that the overt social commentary, which the producers clearly felt was the defining characteristic of The Twilight Zone, often replaces storytelling to the detriment of the episode. The problem is not so much that the episodes wish to impart a message but that the episodes become one-note, lacking the variety which defined the original series. It can be a fine line to walk if a creator does not maintain focus on the story but instead becomes enamored with delivering a social or political diatribe. Even Rod Serling could fall prey to this though The Twilight Zone creator more often produced episodes which could be enjoyed in and of themselves without the need of understanding the social and political context. Like other episodes of this new series, “A Traveler” is littered with references to the original series, usually in the form of names. The mayor is named Matheson in reference to original series writer Richard Matheson. Another character is named Ida Lupino in reference to the actress/director who appeared in an episode, “The Sixteen Millimeter Shrine,” and directed another, “The Masks.” A. Traveler gives two false identities, both of which call back to original series creators. One, Douglas Heyes, was the director of such notable episodes as “The After Hours” and “The Invaders,” the other being Marius Constant, composer of the second, and more famous, original series opening title music. There is also a brief view of a Christmas tree in which Talky Tina and a gremlin doll (from “Nightmare at 20,000 Feet”) can be seen decorating the tree. In all, this one left a lot to be desired, despite some good acting and a wasted atmosphere of dread. Although I have enjoyed aspects of every episode, there is a noted lack of humanism in the new series which is replaced with a bleak and sometimes utterly hopeless outlook on the future of human relations. Whether this is an intended or unintended interpretation of the new series, I feel as though this quality will come to define this new iteration of Rod Serling’s creation. “Replay” concerns Nina Harrison, an African-American single mother who escaped a tough upbringing to become a successful lawyer. She is on a road trip to drive her son, Dorian, to his first day of college. While stopping to eat at a roadside diner, Nina inadvertently discovers that her late father’s video camera, which she has been using to record little moments of the trip, can reverse time when the footage is rewound. At first, Nina is frightened and disoriented but quickly learns to use this strange quality to combat Officer Lasky, a hulking white police officer who relentlessly pursues and harasses the mother and son. Each time Nina and Dorian are confronted by Officer Lasky, Nina is forced to rewind time and attempt to escape the psychopathic officer another way. Yet, each successive attempt at evading Lasky only results in a more intense encounter which escalates in violence until Dorian is senselessly shot to death. Nina reverts time to save Dorian’s life and attempts to form a personal connection with Lasky. The single-minded adversary cannot be swayed from his inevitable course of destruction. Nina is left with one final option, to visit her estranged brother Neil and ask for help. Neil agrees to help get Dorian to the college through an underground tunnel which leads directly to campus. When they arrive, however, Officer Lasky is waiting. Nina is forced to stop running and make a stand against intolerance and oppression. Nina undergoes a modicum of transformation with her decision to stop running and take a stand but she ultimately remains the same character at the end of her ordeal, if not angrier and more paranoid because of it. The minimally-staged ending with Dorian, now a proud father, leaving the house only to be confronted by police, hits the viewer with an even bleaker outlook for the future. 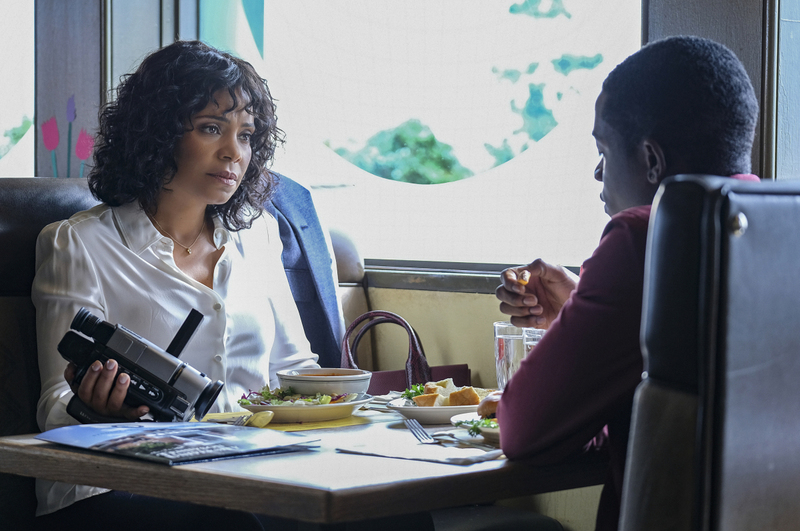 With its overt allusion to The Underground Railroad and its reflection upon the brutal relationship between policing and race in this country, “Replay” may be too bleak for some viewers to find enjoyable. The first three episodes of the new series are very bleak indeed. Maybe it is simply a product of our time but unfortunately there seems to be little room for hope in this Twilight Zone. As much as I love the darker episodes of the series, it is refreshing (and necessary) to occasionally get a “Walking Distance” or “A Passage for Trumpet” to break through the clouds. “Replay” focuses on the theme of struggle: struggle to escape a hard childhood, struggle to find a good career, and struggle to protect your child. This last is the most potently realized in the episode. The relationship between mother and son is believable and emotionally affecting, due mainly to the performances of Lathan and Damson Idris. There is a terrible inevitability to the Harrisons’ encounters with Officer Lasky and the viewer feels the helplessness of being unable to protect the young man, even with the help of a supernatural camera which can turn back time. “Replay” conveys a powerful, affecting, and important message. The American obsession with race and racial characteristics has not only greatly hindered social progress but remains reflected in policing tactics, parenting, and educational opportunities, the issues at the heart of “Replay.” Due to the challenging nature of the episode, “Replay” is going to affect different viewers in different ways. But for those who have been waiting for the sort of social commentary wrapped in a supernatural mystery which made Jordan Peele’s Get Out so memorable, “Replay” is a powerful meditation on oppression, fear, courage, resilience, and the love of a parent for a child. Highly recommended. 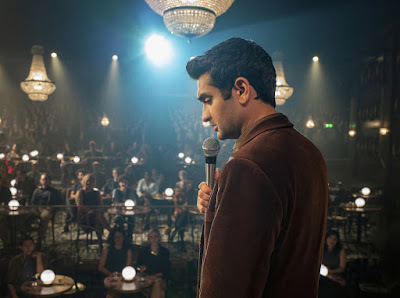 Kumal Nanjiani as Samir Wassan in "The Comedian"
The time has arrived for a wide audience to view Jordan Peele’s revamped version of The Twilight Zone. CBS All Access has released the first two episodes of the ten-episode season. Here are summaries of the first two episodes along with my initial thoughts. “The Comedian” concerns struggling comedian Samir Wassan (Kumal Nanjiani) who dreams of life as a famous stand-up comic. Unfortunately, his act focuses more on political commentary than jokes due to Samir’s belief that comedy must be edifying as well as entertaining. A strange encounter with famous comic JC Wheeler (Tracy Morgan), who has recently disappeared from the public eye, leads Samir to alter his approach to comedy and sends him on an unforeseen path of obsession and destruction. Samir begins to mine his personal life for jokes and discovers that the subjects of his jokes disappear from existence shortly after he delivers the joke onstage. Samir accidentally erases his dog and his nephew before realizing the full extent of his newfound “powers.” Samir is led down a path of revenge by making jokes about everyone who has threatened or hurt him in his life, including former classmates. When he erases a threatening figure in his life, his girlfriend’s attractive mentor David (Ryan Robbins), he unwittingly unravels the core thread of his happy existence. Knowing he has irreparably damaged not only his life but the lives of countless others, Samir decides to tell one final joke, about himself. “The Comedian,” a title which pays homage to Rod Serling’s Emmy Award-winning Playhouse 90 episode (1957), strikes the viewer as familiar since a variation of its theme has been written or staged dozens of times. Not to say it is not enjoyable, because it is, and very well staged, even if its moral message is a bit too on the nose. Above all, the episode sets the tone for this new series as a collection of serious, mature plays which examine the anxieties of Rod Serling’s The Twilight Zone in a modern context. 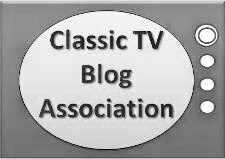 Speaking of mature, those with young viewers should be warned that the new series contains a surprising amount of profanity for a series which has always held appeal for younger viewers. Thematically, “The Comedian” closely resembles the first season original series episode “And when the Sky Was Opened," written by Rod Serling and based very loosely on Richard Matheson's "Disappearing Act." In it, an astronaut (Rod Taylor) discovers that his fellow crew members and anything related to their flight are disappearing. Other episodes, such as "A World of Difference” and “Person or Persons Unknown,” find characters who discover their lives unraveling by unanticipated and uncontrollable methods. In this way "The Comedian" also resembles elements from time travel episodes, such as “Back There” and “No Time Like the Past,” in which the best laid plans are often destroyed by unforeseen consequences. “The Comedian” is also related to episodes such as “Time Enough at Last,” “The Man in the Bottle,” and “A Kind of Stopwatch” in which characters make selfish choices which bring about a harsh fate. As such, it can be difficult to watch a character like Samir destroy himself. As evident from the above comparisons, the new series displays its love of the original series right up front. 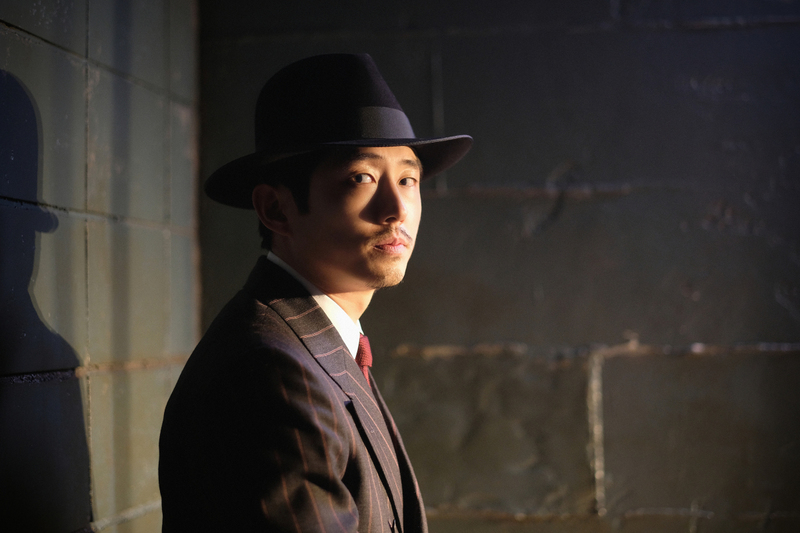 Viewers who feared this series would be The Twilight Zone in name only can rest assured that the production is dedicated to capturing the feel of the original series without falling into parody. Everything from the heavy use of close-up angles to the jazzy musical scores to the shadowy lighting effects call back to the original series in a way neither of the two previous reboots managed. Viewers tend to have personal ideas about what makes The Twilight Zone unique. Is it the twist endings or the political commentary or the somewhat cliché tales of aliens, devils, and evil dolls? For me it is all these things but above all it is the emotional resonance of the material. It is why, in my opinion, a series like Black Mirror will never be the 21st century version of The Twilight Zone. It lacks the emotional impact of the original series, which could break your heart with episodes like “Walking Distance” or “Nothing in the Dark” while also providing the twists, scares, and social commentary which came to largely define the series. It is a bit too early to tell but it appears from this initial offering that the new series will at least do a passable job in attempting this sort of emotional depth. 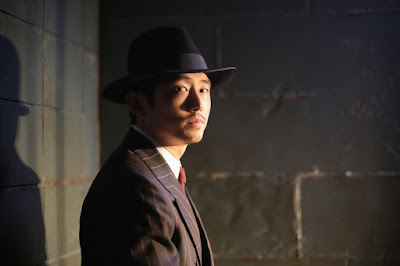 I think a lot of viewers expected Peele’s version of The Twilight Zone to be Get Out every week but, like Rod Serling, Peele is too smart a creator to be locked into doing one type of story and these two early episodes display the diverse nature of the series, although it must be said that both are fairly bleak offerings. We will see if the series offers lighter or more redemptive fare with later episodes. It is also notable that Peele and company are going to allow the story to dictate the run time. "The Comedian" runs a shade over 55 minutes while "Nightmare at 30,000 Feet" runs just over 37 minutes. The new series also appears to be littered with Easter Eggs which call back to the original series. In “The Comedian,” Samir is searching online for old classmates who bullied or otherwise hurt him. Among the names he pulls up are “Mouth” McGarry, Paul Grinstead, and Henry Corwin. All of these names are characters in original series episodes written by Rod Serling. “Mouth” McGarry was the team manager played by Jack Wesson in “The Mighty Casey.” Paul Grinstead was the friendly passenger played by Martin Milner who attempts to help Vera Miles battle her “Mirror Image," an episode, incidentally, which is reputed to have inspired Jordan Peele’s film Us. Henry Corwin was the drunken Santa Claus played by Art Carney who delivered Christmas magic in “The Night of the Meek.” There are doubtless more Easter Eggs in the episode that will be spotted by other viewers and shared online. In all, “The Comedian” is a commendable start to the new series, approaching themes clearly recognizable from the original series but presenting them in an emotionally resonant way in a modern context. 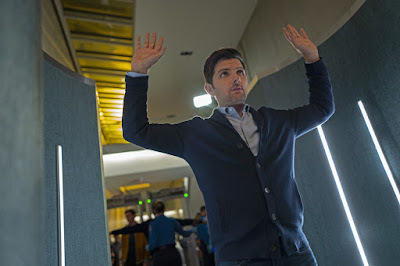 Adam Scott as Justin Sanderson in "Nightmare at 30,000 Feet"
“Nightmare at 30,000 Feet” is an updating and re-imagining of Richard Matheson’s “Nightmare at 20,000 Feet,” a story about a nervous airplane passenger who sees a gremlin tampering with the engine of a passenger jet. Matheson’s story was originally published in 1962 in a paperback anthology, Alone by Night, compiled by Matheson’s literary agent Don Congdon. It was adapted for the fifth season of the original Twilight Zone with William Shatner in a career defining performance as Bob Wilson, the nervous passenger. The story was adapted a second time for Twilight Zone: The Movie (1983), this time with Jon Lithgow as the manic passenger battling a very scary gremlin on the wing of the airplane. Another attempt at adapting this tale poses obvious challenges. Shatner’s performance in the original is one of the finest performances on the series and could hardly be topped. The design of the gremlin in the 1983 adaptation was just about flawless as well, a product of that golden age of practical makeup effects. So, how can a new version be staged which captures the atmosphere of the original story while moving the material into a fresh new direction? This is the challenge set up by the new series. The answer lies in taking the skeleton of Matheson’s story and changing the focus of the nightmare. Matheson’s story lends itself to reinterpretation due to the fact that the gremlin is not required to make the story suspenseful. All that is essential to the drama is the makeup of the protagonist, a character who previously suffered a mental breakdown placed in a situation which again forces him to call into question his own sanity at the risks of the lives of the passengers on the airplane. The suspense arrives from the fact that an airplane cannot simply pull over and assess the trouble. Peel and company understood that the gremlin was not necessary and removed that aspect from the story. In its place? An MP3 player loaded with a very ominous podcast which becomes the focus of the nightmare. This aspect of an inanimate object sowing the seeds of a character’s doom recalls another great Richard Matheson penned episode, “Nick of Time,” in which William Shatner plays a young husband who places faith in the cards spit out by a fortune-telling napkin dispenser rather than in himself. Justin Sanderson (Adam Scott) is an investigative reporter on a flight from Washington D.C. to Tel Aviv. He previously suffered a mental breakdown while on assignment. After going through the grueling boarding process and giving up his first class seat to a family, he takes a window seat in the main cabin and plans for a smooth flight. This is quickly challenged by Justin’s discovery of an MP3 player in the seat back compartment. The player is paused on a podcast, Enigmatique, which tells the story of doomed Flight 1015, the very flight Justin is taking. As he listens to more of the podcast he realizes that Flight 1015 will soon mysteriously disappear, never to be found. Justin attempts to unravel the mystery but only succeeds in drawing the ire of the flight crew and the other passengers. He has apparently made one friend, however, in a pilot named Joe Beaumont (Chris Diamantopoulos) who hitches free rides but never flies anymore due to trouble in his past. He claims to believe Justin. With Justin’s help, Beaumont gains access to the cockpit and subdues the pilots. He lowers the cabin pressure placing all the passengers to sleep before signing off, “Goodnight, New York,” and turning the plane to auto-pilot. Only Justin, with a portable oxygen tank, is left conscious as the plane travels aimlessly high in the stormy sky. Justin wakes up on the shore of an isolated lake. He finds the MP3 player and gives it a listen only to discover that the flight is his personal hell and the other passengers his tormentors. This episode, and the ending, can be interpreted in a number of ways. Some viewers are turned off by ambiguity but I found it a strength of "Nightmare at 30,000 Feet," lending the episode a greater level of mystery and suspense. There are a lot of Easter Eggs in “Nightmare at 30,000 Feet,” beginning with names. Joe Beaumont is, of course, an homage to original series writer Charles Beaumont. 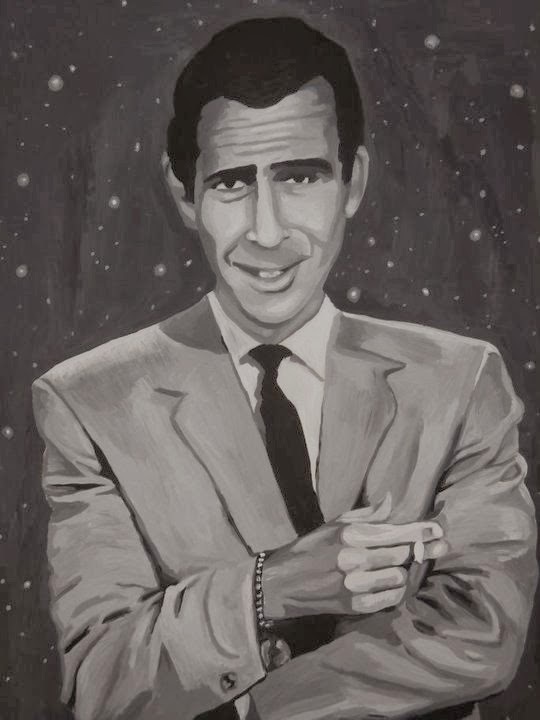 The podcast host is Rodman Edwards, a not-so-sly wink to Twilight Zone creator Rodman Edward Serling. Also, William Tuttle’s original design for the gremlin returns in the form of a doll found floating in the water near the wreckage of the plane. Jordan Peele’s introduction for the episode is also interesting as he delivers it on a screen inside the airplane. The astute viewer will notice that behind Peele one can see that he is delivering the opening narration in the place where the episode will end. There are hints that all of the episodes in the series may be tied together by season’s end. One thing to notice is that Donner is the name of a character in both episodes. For "Nightmare at 30,000 Feet" it is an obvious tribute to Richard Donner, director of the original series episode. But is its presence in "The Comedian" the sign of a larger narrative or simply another use in tribute? These may be nothing more than indirect connections but it will be interesting to see if Jordan Peele and company try and tie the seemingly individual stories together by season’s end. In all, I felt like this was a promising start to the new series. The production value is high, the writing is a creative blend of modern and vintage style, the performances are very good, the reverence to the original series is there, and the overall quality afforded the production is impressive. I have found aspects of every reboot of The Twilight Zone to enjoy and Jordan Peele’s version of this iconic series looks to be a great complimentary offering to Rod Serling’s original. Stay tuned as I’ll be giving flash reviews on each episode of the series as they are released on CBS All Access. Set Decoration: Henry Grace & Don Greenwood, Jr.
Douglas Winter is the struggling owner/editor of the Dansburg Courier. He is drowning in debt due to the fact that not much happens in Dansburg as well as the recent arrival of the syndicate newspaper the Gazette. When his longtime linotype operator, Andy Praskins, leaves to find work at the Gazette, the writing becomes clear on the wall: the Dansburg Courier is finished. Despite the pleadings of his girlfriend Jackie Benson, Doug is prepared to throw in the towel. Doug soon gets to drinking. He drives to the outskirts of town and stops his car on a bridge. He gets out and stands near the edge looking down at the water, contemplating taking his own life by jumping. Suddenly, a voice is heard behind him. It is a small, older man asking for a light for his cigar. The man is odd and begins teasing Doug about his uncertain method of suicide. The man convinces Doug to give him a ride back into town. Over drinks Mr. Smith (as the man introduces himself) informs Doug that he, Smith, is an expert reporter and a skilled linotype operator. Mr. Smith offers to go to work for Doug and revive the Courier but does not divulge what he expects to receive in return. Doug brings Mr. Smith back to the newspaper office and asks for a demonstration of Smith’s skills. Smith is lightning fast on the linotype machine, amazing Doug and Jackie, though Jackie takes an immediate dislike to the man and his gruff manner. Soon, business picks up tremendously for the Courier. Mr. Smith is the first to report increasingly strange happenings around town and his skill on the linotype machine (to which he has added some unique alterations) means that the papers are out on the street unbelievably fast. When the building which houses the rival paper the Gazette burns to the ground, Doug begins to suspect Mr. Smith of more than just reporting the news. Jackie has noticed something as well. Doug’s attitude and behavior are getting worse. He’s sullen and surly and allows Smith to run the newspaper while Doug drinks and naps in his office. Jackie confronts Doug about this and receives indifference in return. Doug finally confronts Mr. Smith and forces Smith to admit who he really is: the Devil. Mr. Smith produces a contract and induces Doug to sign away his immortal soul for the continued success of the newspaper. Doug is at first an unbeliever until Smith demonstrates that he knows the news before it happens. Finally understanding the gravity of his situation Doug tries unsuccessfully to renege on his contract with Smith. Mr. Smith is in a hurry and eager to gather Doug’s soul. Using the linotype machine, he writes a news story: Jackie will be grievously injured in a car wreck a few hours hence. Smith informs Doug that the alternations he made on the linotype machine allow to pass whatever is written there. Smith produces a gun and states that if Doug does not kill himself by the time of the accident Jackie will die from her injuries. Doug tries to use the gun on Smith without success. Smith tips his hat and leaves. Doug frantically searches for Jackie but cannot find her. As the time until her accident draws near he decides he has only one other option. He returns to the office of the Courier and sits down at the linotype machine. He begins to write a news story. Meanwhile, Jackie has agreed to give Mr. Smith a ride to the airport as he has surprisingly agreed with her request to leave Dansburg forever. Mr. Smith offers to drive. Once on the highway, however, Smith begins driving too fast toward a head-on collision with another motorist. At the last moment Jackie is able to wrench the wheel from Smith’s hands and avoid the greater severity of the accident. Smith has vanished from the driver’s seat. Doug used the linotype machine to write the Devil away. He immediately has the machine taken away. But is Mr. Smith out of their lives forever? Immediately following “Miniature,” perhaps his finest script for the series, Charles Beaumont countered with this darkly humorous take on the deal-with-the-Devil tale. Although Rod Serling, Richard Matheson, and Earl Hamner produced fine work for the fourth season, Beaumont flourished writing the hour-long episodes. He saw an opportunity to revisit previously published material and to expand upon ideas and themes prevalent in his fiction. Beaumont never seemed comfortable with the twist-in-the-tale formula the show found itself falling into time and again. Although Beaumont was more than capable of crafting a satisfactory twist-ending tale, “Perchance to Dream” and “Shadow Play” come to mind, few of his other efforts in this regard, such as “Elegy,” “A Nice Place to Visit,” “The Jungle,” or “Dead Man’s Shoes,” are among the show’s highly regarded episodes. The hour-long format generally alleviated the need for this sort of story and Beaumont produced some of his finest work writing in a narrative format with which he was more comfortable. The result was that he produced more scripts for the fourth season than for any of the previous three seasons, made tragically ironic by the fact that during the fourth season Beaumont began to suffer the effects of the disease which eventually took his ability to write and then his life. Even an episode for which Beaumont provided the story and which was ghostwritten by Jerry Sohl, “The New Exhibit,” is an expertly sustained one-hour dramatic narrative. Beaumont’s only misstep during the fourth season was “Shadow of the Valley,” a tale which simply did not have enough story to propel it fifty plus minutes. 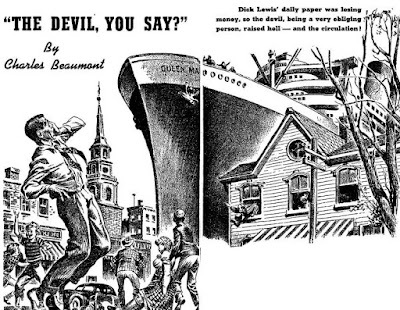 Beaumont’s original story, “The Devil, You Say?” was the author’s first professional sale. It appeared in the January, 1951 issue of Amazing Stories. Beaumont apparently liked the idea enough to revisit it for the series but made enough alterations to indicate he was not happy with the original story. Another such indication was that “The Devil, You Say?” was not included in any of the collections of Beaumont’s fiction compiled during his lifetime. The story was reprinted in the UK edition of Amazing Stories in May, 1952 but was not collected in book form until The Twilight Zone: The Original Stories in 1985, a volume which sought to collect the source material for the series. The story was reprinted a few years later in the definitive retrospective of Beaumont’s fiction, Charles Beaumont: Selected Stories, published by Dark Harvest in 1988. The paperback edition, titled The Howling Man, and published by Tor in 1992. An interesting aspect of the volume is that many of the stories included introductory essays from Beaumont’s friends and colleagues. “The Devil, You Say?” featured an introduction from Howard Browne, editor of Amazing Stories at the time of the story’s publication. Another interesting bit of trivia concerning “The Devil, You Say?” is that the story was sold by Beaumont’s then-agent Forrest J. Ackerman, who became famous as the editor of Famous Monsters of Filmland magazine but worked for many years as a literary agent. Beaumont later signed with the Don Congdon agency, which also represented Ray Bradbury and Richard Matheson. Beaumont used the opportunity of adapting his first published story to make a number of changes to the narrative. Some of these changes are superficial, dealing with names and appearances which do little to alter the course of the narrative. The town in which the original story takes place is called Danville, and the newspaper the Danville Daily Courier. Beaumont changed the town to Dansburg and the newspaper to the Dansburg Courier for the episode. The editor of the newspaper is Richard Lewis in the story, changed to Douglas Winter for the episode. The Devil is Mr. Jones in the story and Mr. Smith in the episode. The appearance of the Devil is altered as well. In the story Beaumont writes: “An old boy who must have been crowding ninety stood in front of the desk, staring at me. And I stared right back. He was dressed in the sporty style of the eighteen nineties, with whiskers all over his face and a little black derby which canted jauntily over his left eye.” The cigar is a prominent prop in both story and episode. A more significant change from the story is in the female lead. In Beaumont’s original story the romantic relationship develops quickly when a reporter from a city newspaper arrives in Danville to interview Richard Lewis. Lewis and the reporter, named Elissa Traskers, hit it off immediately and conspire to outwit the Devil. The romance serves an ironic ending as Lewis forgets to include his relationship with Traskers when he uses the diabolical linotype machine to write the Devil away. When Lewis tracks her down later and attempts to rekindle their relationship she does not remember him and rejects his advances. Beaumont did make changes to the structure and course of the narrative. The story includes an odd narrative framing device in which a larger story is told by a newspaper reporter which switches to Richard Lewis’ story when the newspaperman encounters Lewis in a bar. This framing device also serves an ironic ending as Mr. Jones makes his return: “I was about to start the laughter when I saw something that cut it off sharp. I saw a very old gentleman, with derby, spats and cane, leaning against the bar and winking at me. It didn’t take me long to get home.” Beaumont wisely scrapped this awkward way of telling the story. Also, the suicide angle is new to the episode. In the original story, Lewis decides simply to skip town when it becomes clear that he will not be able to repay his creditors. Mr. Jones, who reveals himself as the Devil much sooner than in the episode, appears to Lewis in this time of need because Lewis’ father, the deceased original owner of the newspaper, struck a deal with the Devil many years ago to ensure prosperity for himself and his son. Lewis’ father has inadvertently cursed him. Also, the news items in the original story have more of a National Enquirer flavor than the tragic news stories in the episode. Examples of headlines from the original story include: Mayor’s Wife Gives Birth to Baby Hippopotamus, and Farmer Burl Illing Complains of Mysterious Appearance of Dragons in Back Yard. Beaumont incorporates a good amount of humor and wordplay in the episode. Notable instances include a reference made by Mr. Smith to the Italian violinist Niccolò Paganini, a musician so prodigiously talented that it was suggested he made a deal with the Devil. The term printer’s devil refers to a position of apprenticeship in a printing shop. Mr. Smith also makes a reference to a need for “a touch of the creature” in reference to whiskey when he prepares to reveal his true nature to Douglas Winter. Interestingly, A Touch of the Creature was the proposed title of a fourth Charles Beaumont collection from Bantam Books tentatively scheduled for publication in 1964. Negotiations for the volume eventually fell through and the book never saw publication during Beaumont’s lifetime. A volume of Beaumont’s unpublished fiction later appeared under the title A Touch of the Creature in 2000 from Subterranean Press. Burgess Meredith (1907-1997) is the most recognizable performer in the episode and perhaps the most recognizable performer on the series. He appeared in a lead role in four episodes, “Time Enough at Last,” “Mr. Dingle, the Strong,” “The Obsolete Man,” and “Printer’s Devil,” a feat matched only by Jack Klugman. “Printer’s Devil” is probably the least familiar of Meredith’s episodes despite the actor’s strong performance and the overall quality of the play. This is likely due to the fact that it is an hour-long fourth season episode which is rarely seen in syndication relative to the half-hour episodes. Nevertheless, for viewers who do not have an aversion to the hour-long format, “Printer’s Devil” offers a wealth of interesting and engaging material, prime among which is Meredith’s performance as the devilish Mr. Smith. Meredith’s long and fruitful acting career frequently took him into the horror, fantasy, and science fiction genres. He appeared in two episodes of Rod Serling’s Night Gallery, including Serling’s adaptation of Cyril Kornbluth’s “The Little Black Bag” and Serling’s original script, “Finnegan’s Flight.” Meredith also found opportunity to occasionally play Devils and demonic characters throughout his career. Meredith played the Devil in the framing narrative of the 1967 Amicus horror anthology film Torture Garden, written by Robert Bloch based on his short stories. He was supremely creepy as a demonic neighbor who terrorizes a fashion model in a New York City brownstone in the 1977 film The Sentinel, based on Jeffrey Konvitz’s 1974 bestseller. Meredith also appeared in the 1976 haunted house film Burnt Offerings, adapted by writer William F. Nolan and writer/director Dan Curtis from Rober Marasco’s 1973 novel. Meredith is probably best known for playing the boxing trainer Mickey Goldmill in the Rocky films, the first performance of which earned the actor an Academy Award nomination. Meredith also portrayed Ammon in Clash of the Titans (1981). The actor has various other connections to the series and the writers of The Twilight Zone. He appeared in an episode of Lights Out, “The Martian Eyes,” based on a story by Henry Kuttner, coauthor of the story “What You Need,” adapted by Rod Serling for the first season of The Twilight Zone. Meredith narrated two of Ray Bradbury’s tales, “There Will Come Soft Rains” and “Marionettes, Inc.,” for vinyl record in 1962. Meredith also provided the voiceover narration for the 1983 film Twilight Zone: The Movie. Meredith’s long and varied career saw the actor play an incredible variety of roles, from historical figures such as Thomas Edison to the voice of Puff the Magic Dragon. Among his most treasured and well-remembered performances is as the doomed Henry Bemis in Rod Serling’s unforgettable adaptation of Lyn Venable’s “Time Enough at Last” for the first season of The Twilight Zone. Patricia Crowley (b. 1933) is another new face to the series. Although she appeared in several films, most of Crowley’s work was on television and she was for many years a recognizable face on the small screen, amassing dozens of credits in a fifty-plus year career. Crowley appeared on such mystery and suspense series as The Web, Suspense, Inner Sanctum, The Alfred Hitchcock Hour, and Tales of the Unexpected, the short-lived 1977 series not to be confused with Roald Dahl’s long-running UK series of the same title. Crowley’s most recent credit is for the independent romantic comedy film Mont Reve (2012). Director Ralph Senensky (b. 1923) is also new to the series with “Printer’s Devil,” his only work for the show. The episode was Senensky’s second directing credit after working as a production designer and assistant to the producer on such series as Playhouse 90 and Dr. Kildare. Senensky bounced around television series for decades working in the director’s chair on a variety of shows such as Route 66, Kraft Suspense Theatre, The Fugitive, Star Trek, Planet of the Apes, The Waltons, and many, many more. He directed the second season Night Gallery episode which included the segments “The Miracle at Camafeo” and “The Ghost of Sorworth Place.” Senensky retired from directing in 1986 after a stint on The Paper Chase but returned to direct the 2013 short film The Right Regrets. Despite its hour length and derivative subject matter, “Printer’s Devil” succeeds enormously as a darkly humorous tribute to Devil tales in the vein of Stephen Vincent Benét’s American classic, “The Devil and Daniel Webster” (1936). It possesses a unique setting in the offices of a small town newspaper, some neat special effects, and features fine performances from the cast, particularly Burgess Meredith, who steals the show as Mr. Smith. One of the more remarkable aspects of the episode is that it moves quickly, a quality the hour-long fourth season episodes consistently struggled to maintain. Charles Beaumont was able to revisit his earliest short story and greatly enhance its charms and correct its missteps. The script also manages to approach some very dark subject matter, such as suicide and sexual harassment, in the context of a dark comedy or fantasy. It is an underexplored and underrated aspect of Charles Beaumont’s work in general. The result is yet another enjoyable fourth season episode which dispels the persistent notion among a certain segment of viewers that nothing good came out of the hour-long episodes. This one comes recommended. It is a solid, above-average offering from one of the show’s best writers and a fun, diabolical good time with a perfect mixture of humor and horror. --Charles Beaumont’s original short story, “The Devil, You Say?” was first published in the January, 1951 issue of Amazing Stories. It was reprinted in the UK edition of Amazing Stories for May, 1952. The story was first collected in book form for The Twilight Zone: The Original Stories (1985), edited by Richard Matheson, Martin Harry Greenberg, and Charles G. Waugh. It was included in Charles Beaumont: Selected Stories (1988), edited by Roger Anker with an introduction to the story by Amazing Stories editor Howard Browne. --Burgess Meredith also appeared in the first season episode “Time Enough at Last” and the second season episodes “Mr. Dingle, the Strong” and “The Obsolete Man.” Meredith appeared in two segments of Rod Serling’s Night Gallery: “The Little Black Bag” and “Finnegan’s Flight.” Meredith also narrated the 1983 film Twilight Zone: The Movie. --“Printer’s Devil” was adapted as a Twilight Zone Radio Drama starring Bobby Slayton. Join us as we explore The Twilight Zone, the enduring television series created by Rod Serling, which produced 156 episodes over 5 seasons from 1959-1964. Images and textual extracts are used for archival and research purposes only. Text unique to the Vortex may be used freely with citation.